Much of this final chapter can be found in Koi2Kichi but there are a few extras in these texts. One only has to look at the breeders whom Tsuyoshi surrounds himself with to realise that he’s much more than the son of his father. He’s not known for being outspoken and to many he comes over as being introspective when that is not the case at all. He still retains Hiroshi’s dry wit and many of his facial expressions. You’ll often find legends such as Seiji Hiroi; Isayaku Nogami and the Brothers Maruhoshi viewing the Koi that Tsuyoshi has produced. Be assured these guys know what they are looking at and they are also too well aware of the heartaches that present themselves when attempting to produce true, world class Koi. Take it from me; Tsuyoshi Kawakami is a dedicated world class Koi breeder who is determined to reach the goals he’s set himself. 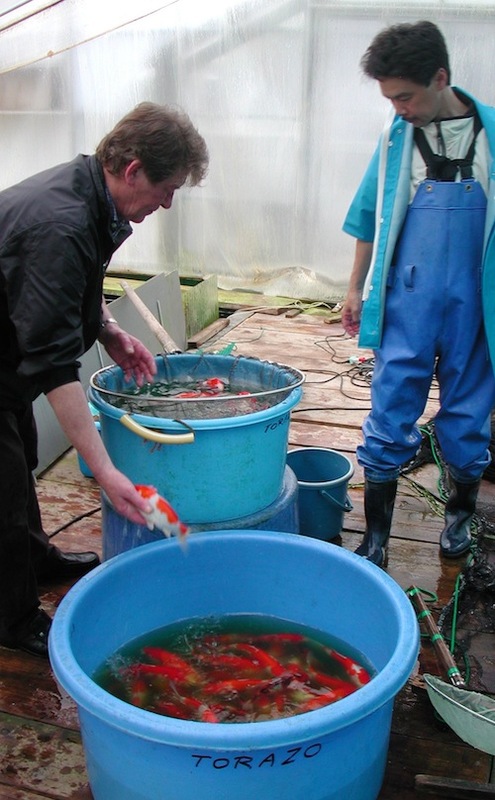 One evening in spring 2002, Tsuyoshi rang my home to mention a special Koi he wished me to see and hopefully purchase. I’d no idea how he’d found my number but I do recall thinking that the Koi must be a special Koi if he’d taken the trouble to find out how to reach me. Two weeks later I was back in Japan to find tosai and returned to Torazo as promised. He showed me the Koi, which was not in his display ponds but in a small indoor pond to the rear of the house. It was a beautiful Sanke, no doubt, but nowhere even near the size required to compete for the Supreme Award in a show. In short I had some doubts going through my head on viewing her for the first time. I did mention that it would not be a Sanke he had produced and he openly admitted that it belonged to a valued customer who had to move out of Japan for his company. He’d taken the Koi to Tsuyoshi and asked him to try and sell it on his behalf. The Sanke was from Matsunosuke parents but he’d found her in central Japan and had no idea who actually produced her. I asked a favour of him to grow it for the summer of ’02 and let me have first option on the Koi after harvest, he readily agreed. Immediately after the 2002 harvest she was measured and had increased size by 7cms. We both smiled after seeing the improvement in shape and skin, I bought her and sold her within days after sending her picture to some customers. She was kept in a UK pond from late 2002 to mid 2009 and then entered into the BKKS National show at 80cms. She won the 2009 Supreme Champion award and was still tategoi! As to the quality of Koi Tsuyoshi is producing today, here is a 50cms nisai tategoi of his that arrived into the UK earlier this year. No photoshop, no expensive camera, but there are only a few guys in Japan who can equal this kind of ‘understated’ quality. I conducted another interview with Hiroshi in 2003 in order to try and understand the real truth as to the origins of the elusive Torazo Sanke I had never seen. Tsuyoshi stood by as interpreter and added some thoughts from time to time and this is a précis of what was related. 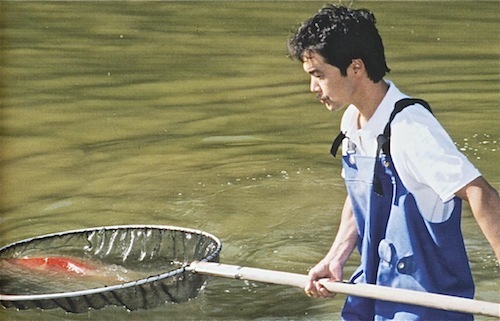 Chuzo Kawakami started breeding Kohaku in 1910 purely as a pastime. In the mid 1920’s his son Torakichi started Sanke production in times when he was trying to sell his Koi to other parts of Japan as parent stocks – not easy to do in those early days when few had actually seen a Koi. However, it was not until the years from 1949 to 1953 that Hiroshi Kawakami started and then stabilised the famous Torazo line of Sanke. He did this by using one of his father’s females and pairing it with a male Kohaku purchased from Yagozen in nearby Koguriyama village. Hiroshi mentioned that the genuine Torazo Sanke had very unusual sumi qualities at tosai stages when it appeared very strong, but after two years of growing, most of the vivid sumi patterns had disappeared. The true sumi (striped) patterns only really start to show again when the Koi reached four years old and in later years this sumi increased in both size and boldness. Again, I have never seen a Torazo Sanke, but one can only wonder as to how beautiful they must have been by the adulation they received from breeders and enthusiasts all over Japan for many years. Today, all this is merely history but it must have had some real relevance for it to change the name of the well-known family business from Urakawa to Torazo!